Place potatoes in microwavable bowl. Microwave uncovered on High 5 to 6 minutes or until potatoes are just tender. Add corn to potatoes; drizzle with 1 teaspoon of the oil, and sprinkle with 1 teaspoon of the seasoning; mix until evenly coated. Place shrimp in medium bowl; toss with remaining 1 teaspoon oil and remaining 1 teaspoon seasoning; mix until evenly coated. Place equal amount of sausage on center of each sheet of foil. Dividing evenly, arrange potato and corn mixture around sausage. Divide shrimp evenly over sausage. Squeeze 1 wedge of lemon over each pack. Place packs on grill over medium heat. Cover grill; cook 6 minutes. Rotate packs 1/2 turn; cook 5 to 7 minutes longer or until shrimp are pink and sausage is heated through. Remove packs from grill, cut large X across top of each pack. 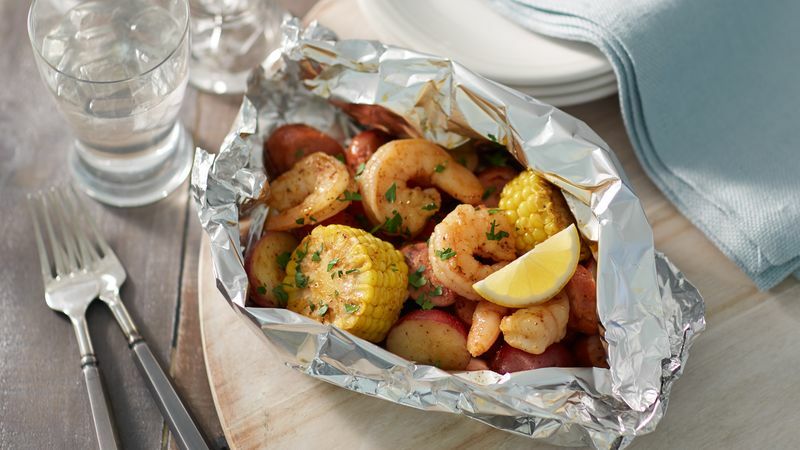 Carefully fold back foil; sprinkle with parsley, and top with remaining lemon wedges. Two ears of fresh sweet corn can be substituted for the frozen corn in this recipe. Cut each ear into 4 pieces. To make in oven, place packs on cookie sheet. Bake at 375°F 23 to 25 minutes or until shrimp are pink and sausage is heated through.